This video. Folks. I hesitate to ever say it. This video may very well be nuts. Halloween isn’t over until ever spook and scream and squeak has been sufficiently squeezed out of our yell-holes (also known as our mouths to those who are not as wise in the art of mouth sciences), and this fantastic visual is up there with those 151 Poke’mon Jack-O-Lanterns for just innovation meeting absurdity. Comic book artist Sean Chen posted this image of a squirrel feeder he made where the results will, well… have you screaming. Check it out. 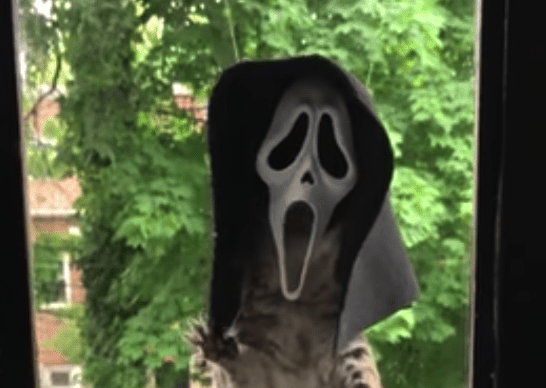 So next time you’re watching a Scream movie and find yourself getting a little more spooked than you would like, just imagine how much scarier that movie would be if the Scream Mask Man had the body of a giant squirrel! That’s some monster movie stuff! Actually… hmm. Pretty good monster movie stuff. Note to self: make squirrel slashes movie. Or would it a squirrel gnawer movie? Squirrels do more gnawing than slashing I feel like Hmm. All good notes. Hmm. Squirrel feeders with novelty heads have been done before, and courtesy of Boing Boing, here is a line of them from Archie McPhee’s. There’s a cat, a horse, and my favorite — just straight up a bigger squirrel. There’s even one with a Donald Trump head from back when the guy was so awful it was kind of amusing and horrifying instead of just mostly horrifying. Ah the memories! We embedded the video of that below! It’s actually great! What do you think of the video of the Scream Headed Squirrel? What would you dress up a squirrel as if you could get at it without it biting you or judging your taste in horror movies? In my case I think I would dress it up as Brundlefly or the TV from Videodrome. Something real Cronenbergy and cool. Yeah. That’s the ticket. Yeah. Anyway, let us know in the comments or on Twitter at @WhatsTrending.